Sometimes I need to upload, embed, or display inline an image in a question or answer. How can I do that? Note: Some sites require 10 reputation to embed images in posts. 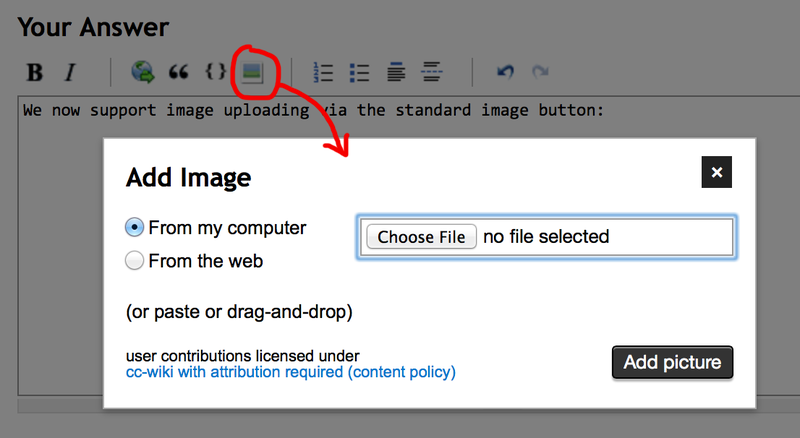 On those sites, you can still upload images using the below tool, but you won't be able to embed those images inline; you can only link them. Another user with the required rep can edit image links into embedded images. After that, replace the default "enter image description here" with something meaningful. For the screen readers of visually impaired, for browsers that don't show images, for cases where Imgur is blocked, and for search engine indexes: please enter a good description. 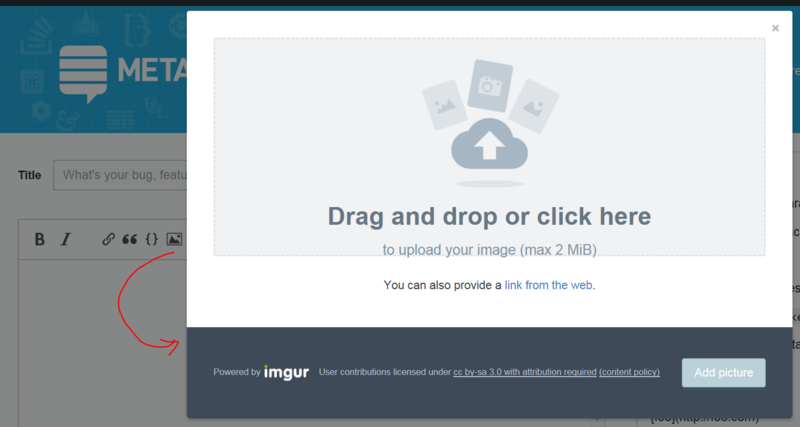 Even when selecting "from the web", the image will be copied to the Stack Exchange Imgur account, and hence will stay even if the original image link is broken. Be aware that the image will disappear if the link gets broken. Note that the image must come from an HTTPS source in order to show as an embedded image. Images from HTTP sources will show as just a link, to prevent "mixed content" warnings. All images uploaded to the Stack Exchange Imgur account in the manners above are from an HTTPS source and will display properly. Whenever possible, use the Stack Exchange provided hosting as described above. This ensures images are never lost. Images on many other free image hosters will expire if not requested every now and then, and the post should be useful for future visitors. Also, this is necessary if your image is from an HTTP source, as such images cannot be embedded for security reasons (see above). Not the answer you're looking for? Browse other questions tagged support faq images . How do I post a screenshot on Stack Overflow? How do I display image in a post on Stack Overflow? How can I add a screen shot into my question? How do I display inline image in a post on Stack Exchange / Stack Overflow (not a link to a photo)? How can I add an image to a comment?